Did you hear? FreeDarko Presents: The Undisputed Guide to Pro Basketball History will be officially released on October 26, and the celebration is beginning early. In the tradition, of Pele Week over at the fantastic soccer blog, Run of Play, Brian Phillips (of Run of Play) has allowed us to adapt the concept to create DREAM WEEK. This series will undoubtedly last well over a week and will feature the finest talents in sportswriting including the authors of the Undisputed Guide to Pro Basketball bringing their best Hakeem Olajuwon-related posts on the blog until the book drops. As I have blurted many times previously, I spent a good portion of my youth working for the Minnesota Timberwolves. Scott Brooks was the first player I met on the job and the last player I ever thought would be mentioned in a Jadakiss song. 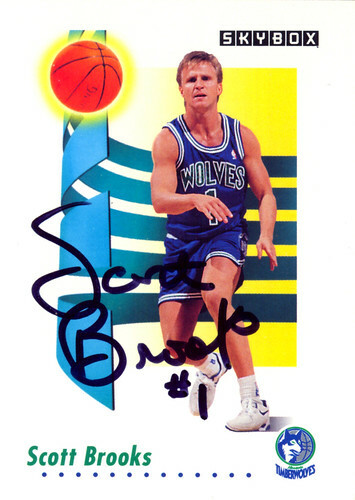 In a league full of a--holes, Scott Brooks was the nicest guy around. About 19 years ago, I worked my first game, an exhibition contest against the Bucks in St. Cloud Minnesota, and Brooks gave me a five dollar tip even though I did pretty much everything wrong that night and was swimming in a warm-up suit three sizes too big for me. Brooks continued to be my best ally on the team through his brief tenure as Pooh Richardson's back-up on the Wolves, and when he was traded for a 2nd round pick to the Rockets in 1992, I figured that was the last I would see of him. I was stunned then, while watching the 1994 playoffs that Brooks was playing alongside Hakeem, for the eventual championship Rockets. I also remember, in the few minutes he played, he actually didn't look so bad. He was scrappy as hell, and seemed to hold the team together with (I believe) Kenny Smith on the bench. Of course Brooks would go on to win the championship that year, and after his playing career ascend through the ranks of coaching, winning coach of the year award last year. Does this have anything to do with Hakeem? Probably not. But looking back on the supporting casts that Olajuwon had during his championship years--Matt Bullard, Cassell, Horry, Mad Max, old-Drexler, Kenny Smith, Mario Elie, Otis Thorpe--one realizes how much Hakeem's greatness pervaded the entire team, elevating the level of play of each one of these not-quite-stars and journeymen. In the age of the dual-superstar championship, Hakeem defied all logic and created an economic structure of trickle-down greatness. As great as Rudy T was as a coach, these Rockets disciples descended from Olajuwon, not Tomjanovich. Listen to Kenny Smith talk on TNT, savor the clutch performances of Cassell and Horry over the years, and watch Scott Brooks coach...one can plainly understand the pedigree that Dream instilled in all who walked with him. Loved the first one. Can't wait. Fantastic, right on the mark. And I can't wait to read the essay (on Jordan but centered on Hakeem) in the book. i watched some hakeem highlights over the summer... totally blew me away. couldn't help but feel i didn't appreciate him enough growing up in the era of jordan, barkley, nique & co.
if dwight is the best of the the best currently... the center position has taken a big step backwards. if magic redefined the 1, MJ the 2, and lebron the 3, what will the next incarnation of the 5 look like? the dream was both grace and force supreme. a total anomaly. i can't fathom how a center could be next-level dominant. shaq might have been able to redefine it through sheer physicality, but i think he was more incremental than next-level (mostly cause he wasn't driven by greatness). looking forward to reading more about THE DREAM! i could never get enough of (h)akeem and kool moe dee together on the old nba superstars tape. the footage of the dream "rapping" never ceases to amuse a brother. how ya like me now! I think I still have that entire 1991(?) Skybox set sitting around somewhere in my mom's basement. @suckingfunglasses: NBA Superstars. Bonus gift with an SI subscription. I watched that tape over and over and over. Bird + John Cougar. MJ to Take my breath Away. Magic & Janet. Chuck & Pat Benetar. Teddy's Jam. Nique & Yanni. On and on. Christmas shopping done. Everyone's getting NBA Superstars DVD and The Undisputed Guide to Pro Basketball History. It is really great to know about that. I would love to know about basketball players. Thanks a lot for the sharing this with us. We have an site, Which offers you the Best Pay Per Minute Webcam Script solution. Our Pay-Per-Minute Webcam Software charges by the minute to build your Adult Webcam Site much easier in such little time.Choose our unique Pay Per Minute Video Webcam Chat Script for a better platform to your Adult Webcam Site.